A young psychic is recruited by an organisation trying to control the President of the US. 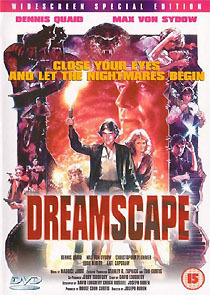 Joseph Ruben’s engaging 1984 thriller is about a young man with psychic abilities (Dennis Quaid) who is recruited into a secretive government project, unaware that shadowy intelligence operative (Christopher Plummer) is using the organisation in his plot to control the President of the US, by exploiting his private fears of a nuclear holocaust. Sadly MIA’s Region 2 disc is simply horrendous. The disc has an insanely low bit rate that hovers around the 30% mark throughout, and consequently the (un-enhanced 1.77:1) picture is plagued with constant digital artefacts. (Ironically, the name of the horse that Quaid bets on is High Compression!) The sound is Dolby 2.0, and sounds hollow and phasey. For some reason MIA has elected to release the film using a terrible photo’ montage sleeve with an ugly amateurish logo. Potential customers might want to know that the inlay is double-sided, and has a much classier sleeve, featuring Drew Struzan’s original theatrical artwork, on the back, (the only advantage that the UK disc has over the US disc, which is 16:9-enhanced and has 5.1 Dolby Digital and DTS soundtracks, and a patchy commentary track by three key crewmembers).